Bioware holds to its promise to release its upcoming MMO in 2011, with only 11 days to spare. 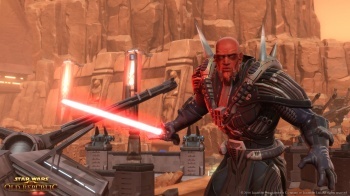 After what seems like ages, Bioware has finally bitten the bullet and announced the final release dates in North America and Europe for the long-awaited and much anticipated The Old Republic. On December 20 (just five days before Christmas; I guess Bioware isn't banking too much on huge holiday sales) the game will be released in the US and Canada, and two days later across the pond in Europe. The subscription price is nothing terribly surprising, and in fact has the exact same pricing structure as the game that will (as always) be the MMO's primary competitor: World of Warcraft. So that's $14.99 a month, $41.97 for three months, and $77.94 for a six month subscription. Translated for those readers of a more European persuasion, that's €12.99, €35.97, and €65.94 respectively. I'm not sure what will be more heartbreaking: the crushed spirits of unfortunate gamers unable to get their mitts on a copy of the game when it is released, or the downtrodden and pitiful expressions on the faces of countless family members when gamers ditch Christmas in favor of lightsabers and Wookies.